You had me at hello…remember that line from Jerry Maguire? Well, that quote holds true for the entrance to Sixteen at Trump International Hotel and Tower. After walking through hundreds of wine bottles and seeing the great view, this restaurant had me at hello. 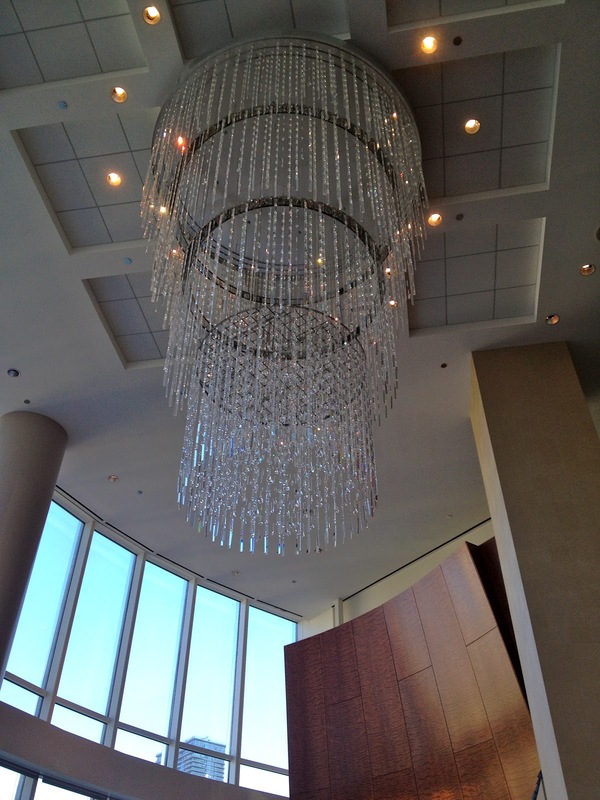 In case you didn’t guess, Sixteen is located on the 16th floor. I guess the name is their way of reminding you what great views you will have from the restaurant. I mean, look at the Wrigley building and Tribune tower as seen from our table. The entire restaurant is open on one side with huge windows. There is also a terrace that I want to come back to when the weather warms up. We had two meals at Sixteen: a very light lunch and breakfast the morning we were leaving. That is the lunch menu above (click here for a bigger view) and the gorgeous chandelier in the restaurant. I never did get to see what it looked like at night, but I bet it was beautiful. I’ll start with our lunch. I had the pumpkin soup (above) and it was delicious. I loved the pepitas on the top; gave it a nice little crunch. My husband had the salmon tartar (below), which was equally yummy. We went pretty basic with breakfast. Honestly, I had eaten so much over the weekend, I just didn’t feel like I could do something rich or heavy. I had the eggs (over hard) with bacon and potatoes and my husband had oatmeal with a side of bacon. I liked the presentation of the oatmeal with the syrup, brown sugar and fruit (which I stole). Both times we visited Sixteen was a positive experience and that was due, not only to the food, but also to the great service. They were so friendly and prompt. We were very pleased. I would love to go back and eat at Sixteen for dinner. As I was writing this post and typing the name of the restaurant over and over, I got to thinking. If I had a restaurant, what would I name it? Sixteen isn’t the most creative name in the world. What would you name it? Not sure what I would name a restaurant, given the chance, but I do know that I would enjoy eating at Sixteen. 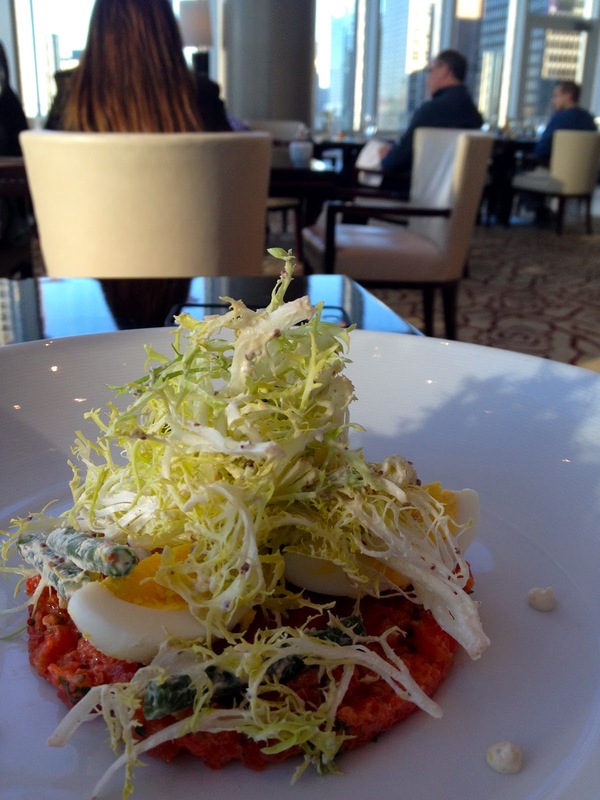 That salmon tartar sounds and looks delicious! It was quite tasty! Great place to eat! This looks like a fabulous place to visit. The quality just shines through. I tried clicking on the menu picture but was unable to enlarge it. I bet the place was pricey? It was yummy! I think the picture turned out so well because the natural light in the restaurant was amazing! I scroll down to your older posts and am hit with more foodie delights! You're spoiling me, Sonja! Love the way breakfast is served. Yes, I liked the presentation as well. Have you ever been to Chicago?